Within these 27 ton log splitter reviews, you can find out which is best suited to your individual needs. These specific machines have been hand picked from the various 27 ton models available. I personally feel that they are the best within this ram force category which offer the maximum features and provide splitting reliability. Which after all, is what we all need. Log splitters come in many different ton ratings ranging from small 4 ton electric machines, to the beastly 37 units and even higher for the commercial user. Which makes it hard to know just what log splitter is right for you, especially when every unit claims they are the best. So what I wanted to do was go through the 27 ton units and just find out who currently offers the best in the 27 ton range. With my personal experience and taking advice from other experienced splitters I have done the hard work for you and this is shown below with each splitters being analyzed for their pros and cons. So if this is of interest for you and you want to know just what are the best 27 log splitters are, then ahead you will find my 27 ton log splitter reviews. Out of all the 27 ton log splitters that I have looked at these are the two I consider to be the best on the market in 2018. That was the Dirty Hand Tools 27 ton, and the Ariens 27 Ton. This was a very difficult choice considering the amount of great 27 ton units out there and some of the biggest brands didn’t make my list. To be considered the best 27 ton log splitter it had to be an outstanding unit, that not only split some of the biggest logs, it had to be reliable and durable. With the ability to go into a vertical position and be towed, there really isn’t much of a point to such a large machine to me if you can’t tow it. But not only did this splitter have to have all those features, it had to be affordable, since log splitters are so expensive they aren’t always that accessible for everyone. With all that in mind It’s time to find out what I consider to be the best 27 ton log splitter going on the current market, so read below for my buyers guide for choosing the best 27 ton log splitter reviews. The Dirty Hand Tools 27 ton wood splitter is an absolute beast of a log splitter, that is in my personal opinion the best log splitters of 2018. The thing that really impressed me with this log splitter is just how strong and dependable it is. 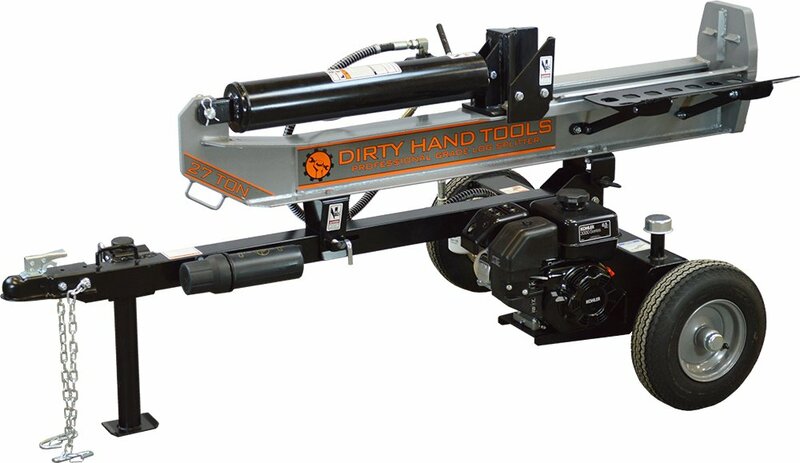 This is something that the company Dirty Hand Tools has come to be the market leaders in my opinion. I believe it comes from the fact that they are based in Colorado, and it is where they design and engineer all there tools. If you make tools to handle the harshness of Colorado then your tools have to be made to handle the toughest jobs, for long periods of times. This machine is powered by the Kohler SH265 196cc engine which is a very reliable engine that puts out some serious power. This not only makes this splitter strong, but quick also. Some people don’t worry about the speed of a log splitter, but I find it important by just shaving off a few seconds every time you split, you’ll save hours every year. This is one of the areas where this machine stands out while normally its cycle speed is about 14 seconds, this isn’t the whole story. For me I rarely needed to run the ram the whole way through since the logs would split easily with this splitter the cycle time was actually more about 10 seconds. Now one of the most important parts of a log splitter and that is just what logs can you split with it? This can be a tough question when you unit has both splitting positions and this is still the case with this machine. It’s vertical position can practically split what ever you put underneath it as long as you know what your doing. With larger logs underneath its vertical position your best way to split is to start from the edges and work your way inwards, and after multiple splits you will get through the log. The horizontal position is a different story you’re unable to do that in this position. But that didn’t stop this splitter from making short work of some 28 inch wide oak logs. Which only made this splitter slow down when they got particularly knotted. It didn’t stop it which is the important factor to me. 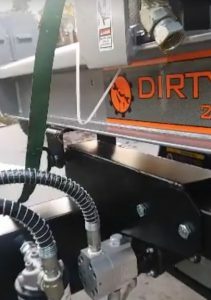 The main thing I like about the Dirty Hand Tools log splitter was just how reliable and durable it was, it started every first or second pull which is what you want with a machine like this. The Kohler engine at first caused me some concern since I really like Honda engines. Call me crazy I know. But my worries all added up to nothing. After doubting the engine, I was surprised to find out it has plenty of power and is extremely quick for powering 27 ton ram force. As I said above being able to tow splitter of this size is a necessity and that is exactly what you can do with this DHT splitter. The included DOT approved 16 inch high speed road tires and 2 inch ball makes this one of the best log splitters to tow on the road. This machine comes with a nice addition of a log cradle which is a nice quality of life improvement, not having to pick the logs up off the ground is a nice bonus. Tho sometimes logs have a tendency to get caught on it which can be annoying. But overall its a massive feature I couldn’t live without. The price of this unit is one of the larger selling points, most splitters of this size you would normally expect to pay anywhere near $2000 to $2500 which isn’t the case with this machine. So you could say I was sold immediately when I saw the price tag. To see the current price, see DHT Splitter on amazon and while you’re there, don’t forget to read the reviews. While in the video they aren’t splitting the largest most difficult logs, I thought it was good to show just how quick this splitter is and to give you a bit of an idea on how it runs. 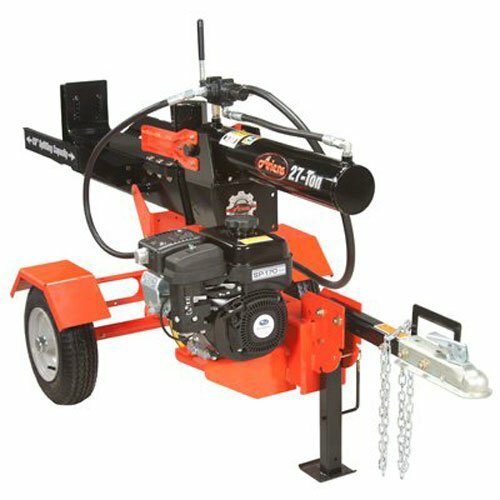 The Ariens 27 ton gas powered log splitter is a pretty impressive beast, tho it is a little on the expensive side. So if you’re on a bit of a budget then I would recommend the DHT above. But apart from the upfront cost of this machine there really isn’t any downside to it. One of the things that I like about this unit is that it is manufactured in the USA, which is something I will always rank quite highly and is something I consider to be important. This certainly isn’t the only reason that this unit made the list. It made the list because it is a reliable and very powerful log splitter. One of the strongest features of this log splitter is its impressive engine, the 169cc Subaru SP-170 engine. This is a very powerful engine that produces a lot of splitting force, and some pretty decent speed. But not only that it is a very reliable engine which you come to expect from Subaru, who make some of the best engines on the market. This Subaru engine makes this quite a quick log splitter with a cycle time of roughly 16 seconds, which is actually quite good for a 27 ton unit. Tho it is slower then the the DHT above, which is something to consider if speed is a preference. The splitting power of this unit is what makes this Subaru engine really great. This log splitter also has the vertical position which still means it will split whatever you put underneath it. Which is the same as the DHT above, but what makes this stand out from the unit above is just what it will split in its horizontal position. This is where it really impressed me and and earned its place on this list. Hickory is one of the toughest logs to split, it can make the toughest splitter struggle on them even when they are smaller. But this 27 ton was able to split hickory that were 18 inches in diameter. The thing that was impressive about this was how this unit didn’t struggle at all splitting this logs. The Subaru engine is very quiet for a gas powered splitter, still noisy compared to an electric. But I found it noticeably quiet compared to other units. This unit is also towable due to its DOT approved tires, and 2 inch ball coupler. This is something that a larger log splitters must have so I was glad it was on this unit. The sheer splitting power of this log splitter, but not just the power. But how its power so constant very rarely did this unit slow down, and only the largest most knotted logs that a 35 ton would just be able to get through. Not everyone needs a 27 ton unit and some people need a larger splitter which is what I will offer here in my other reviews. If you think 27 tons is more power then you need then I would recommend a 22 ton unit, they will still split some decent sized logs just not as large as this beast will. You can find my reviews for 22 ton log splitters here. Tho if you’re like me and like to have either some really knotted hard wood like dog wood, or just like to have more power then the task at hand requires, I would recommend a 35 ton log splitter. These beast splitter will just get through every log you put them against, which you can find my reviews for 35 ton log splitters here.